The residents of Central Pennsylvania and its surrounding area are fortunate each summer to have a robust list of concerts. Artists and bands stop by on their national and international tours to local venues such as Hersheypark Stadium, GIANT Center, Wells Fargo Center, Bryce Jordan Center and Santander Arena. With concerts in such a close proximity as Harrisburg, Hershey, Reading, State College and Philadelphia, there is plenty of opportunity to see your favorite musicians at one of these venues. Why not start your partying before the concert and keep it going afterward? Premiere #1 Limousine Service has great package deals waiting for you during this coming concert season. 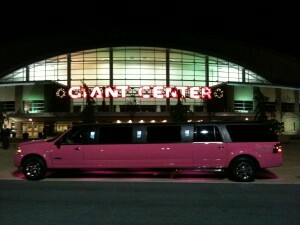 Make a night of it and let us provide your concert transportation. You don’t have to worry about not being able to drink so that you can drive home. You can avoid the stress of parking, the fees and finding a spot in the lot. Let Premiere handle all of that for you. Have a group of friends going? Having fun on a couple’s night with your loved one? We have options for everyone. Sedans, limousines, passenger vans, minibuses, party buses and even motorcoaches; we can accommodate any amount of guests you have going along for the night. We have compiled a full list of upcoming concerts this summer. Click here to view our list. Many concerts fall on the weekdays, so be sure to take advantage of our weekday rates which are available everyday Sunday through Thursday. Don’t hesitate to view our list and see who’s coming to town that interests you. And contact us for further details on booking your concert limousine rental today from the best limo service company in Central Pa.